WASHINGTON — The US Air Force is working with Boeing to double production of the smart bombs used in the fight against the Islamic State group, a goal the service expects to reach by late 2017. 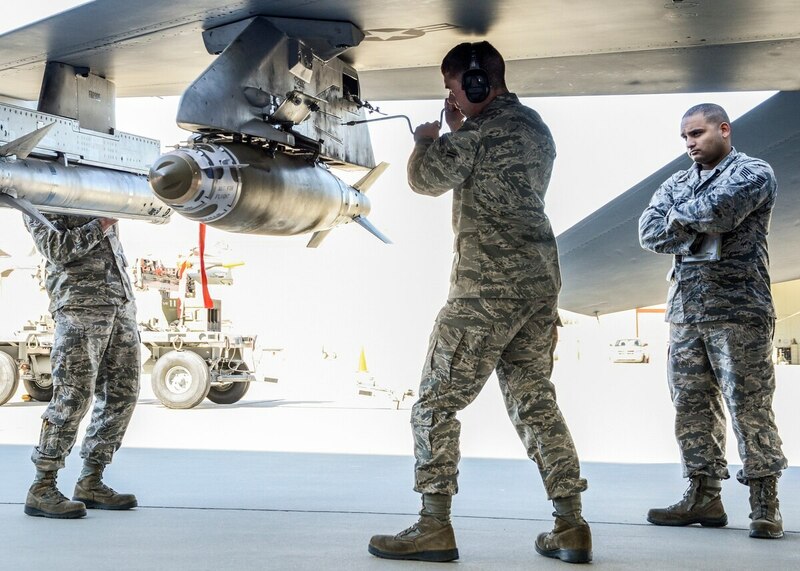 In the latest step toward achieving that target, the Air Force awarded Boeing a $325.8 million contract to build an additional 15,000 Joint Direct Attack Munition (JDAM) tail kits, the Pentagon announced March 31. Work on the kits, which add precision guidance capabilities to conventional bombs, will be performed at St. Louis, Missouri, and is expected to be completed by March 29, 2018. "Boeing stands ready to adjust production quantities for any of our Weapons & Missile Systems programs to meet warfighting mission needs quickly and affordably," company spokeswoman Katie Kelly told Defense News in an email. The recent contract is part of the Air Force's effort to replace the smart bombs it has expended during Operation Inherent Resolve against the Islamic State group in Iraq and Syria. As of late March, the service had dropped 4,748 bombs in 2016; in 2015, aircraft released approximately 28,675 weapons, according to statistics from Air Forces Central Command. Recent expenditure rates in current operations are much higher than seen in previous contingencies, the Air Force told Defense News this week. The diminished stockpiles are also partially due to strained budgets and historically low procurements over the past decade. "Due to current operations, the shortfall in JDAM tail kits will continue to increase. The root causes of the problem include extremely high expenditure rates — higher than previous contingencies — and a starting inventory below the desired objective," Air Force spokesman Maj. Rob Leese said March 29. "The Air Force is mitigating the shortfall with three lines of effort: the rebalancing of stockpiles across combatant commands, the employment of alternative precision-guided munitions (PGMs) when possible and increased production of tail kits." The Air Force is currently negotiating with Boeing to increase production capacity from 18,900 units per year to 36,500 by the fourth quarter of fiscal 2017, Leese said. Overall, the Pentagon's FY17 budget requests $1.8 billion to buy 45,000 smart bombs and other guided munitions to replenish supplies in the continuing campaign against ISIS.